The Motion Picture Association of America has announced it is to sue people who are illegally downloading movies from the internet, with the threat of fines of up to $30,000 (£16,300) per film. The move follows that of the music industry in the US and Europe in trying to stamp out piracy. 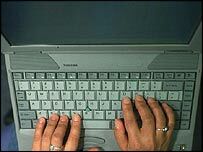 More or less every film produced is available to copy from the internet but the process of downloading films on to a computer is certainly not for the novice as software programs have to be downloaded before getting started. Even with a broadband connection one film of DVD picture quality can take between eight and 12 hours to download on to a hard drive, compared with a music track which can take as little as 30 seconds. If someone then wanted to copy the film on to a DVD this would take another large chunk of time, meaning one film could take up to 24 hours to download and copy. There is also often no way of knowing what the quality of the recording will be. It could be DVD quality or filmed on a shaky camera in a cinema. Most users would then have to watch the film on a PC monitor, although there are gadgets which allow it be screened on a TV. How popular is film downloading? The film industry has been fighting film piracy since video recorders became common in most households, with pirate videos and then DVDs a worldwide and continuing problem. Then came the advancement of the internet which offered a new outlet for films to be illegally copied. Although the problem of piracy on the internet was fuelled by music downloading, the MPAA is concerned at the rise in films being downloaded. It has suggested that one in four internet users download films. Although movie downloading is still in its infancy, the MPAA fears the film industry will be hit as hard as the recording industry once internet speeds quicken. Why is the movie industry worried? Hollywood is big business and studios say piracy is costing them billions. It wants to dispel the conception that film piracy is a victimless crime by accusing downloaders of stealing films, which in turn risks the livelihoods of thousands of employees in the film business. Despite concerns over piracy and an expected flurry of lawsuits Hollywood studios enjoyed record takings of $10.85bn (£5.89bn) last year. Who risks being sued and what punishment can they expect? The MPAA is going after those who illegally copy films by downloading them on to their hard drives, as well as the pirates who put the films on the web in the first place. The organisation says the crackdown could see hundreds of lawsuits generated in one month alone. The law states $30,000 (£16,300) damages can be sought per film, while it can go up to $150,000 (£81,432) for wilful infringement. How can the MPAA trace those people it wants to sue? It wants to get across the misconception that internet users are anonymous and that they "will be held responsible for their actions". The alleged offenders will first be traced by their internet service provider(ISP) address. Subpoenas will then be filed against the service providers, forcing them to hand over names and addresses. Is the MPAA doing anything to further the cause of legal downloading from the internet? There are a number of legal film downloading sites but these are available only in the US and still require considerable hours to use. The MPAA says it is investing millions of dollars in research and development of other viable legal downloading systems such as protected websites. But it has been slow to emerge as a viable market because of the length of time it takes to download one film.